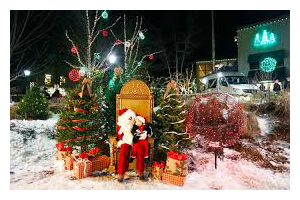 Each year FreeportUSA presents one of Maine’s most popular holiday celebrations, Sparkle Celebration! The event starts with a Parade of Lights down Main Street to wake up the famous Talking Christmas Tree. The fun continues all weekend with loads of free events and activities including visits with Santa, horse drawn carriage rides, a Holiday Movie Marathon, festive rides aboard the Amtrak Downeaster, a Tuba Christmas Concert and more! Best of all – it’s all free! Visitors will enjoy great events, activities, and shopping throughout the weekend. L.L.Bean lights up the skies with a Musical Holiday Light Show featuring music and choreographed colored lights with a different show each hour, five times a night, on the hour from 6-10pm on the L.L.Bean campus. Once the Talking Tree on Main Street is brought to life, children delight in asking the Tree questions and hearing the unique responses. Jump on to a horse drawn carriage for a tour of the village starting in front of the L.L.Bean Flagship Store on Main Street. Children can play in the Crooked Playhouse Village and the whole family will enjoy taking photos in front of whimsical backdrops at L.L.Bean.